The Negev may replace Ben Gurion Airport for international travelers, according to a proposal by Deputy Prime Minister Silvan Shalom. International travelers in and out Israel may find themselves in the Negev instead of at the venerable Ben Gurion Airport in a few years. Deputy Prime Minister Silvan Shalom, who also is Minister for the Development of the Negev and the Galilee, has proposed a new international facility to boost growth in the Negev and take the load off the Ben Gurion airport, located between Tel Aviv and Jerusalem. He noted that environmentalists and residents may object to building a new airport near Be’er Sheva, “the capital of the Negev,” but added the same objections are even stronger against building a new airport in the Western Galilee, several miles east of the coastline between Haifa and Tel Aviv. 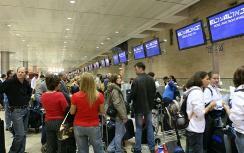 “There is no doubt that Israel needs an additional international airport as soon as possible,” Shalom wrote. “The number of international travelers is expected to surpass 12 million a year, compared with the current 10.5 million, and it would be better to plan ahead of time. “The question that we need to ask today is if we are taking a decision that will bring the changes and develop the entire southern region, or will depress another region and bring ecological and social hardship." Shalom (pictured at left) argued that while local authorities in the Galilee opposed an international airport in their region, “everybody” in the Negev wants it at the Air Force base in Nevatim, several miles north of Be’er Sheva. “Night flights will be allowed at Nevatim but not at Megiddo [in the Galilee),” he explained. “An airport at Megiddo is liable to security problems because it is so close to the Green Line, while Nevatim is not subject to such problems.